In a world full of differences, separation is inevitable. 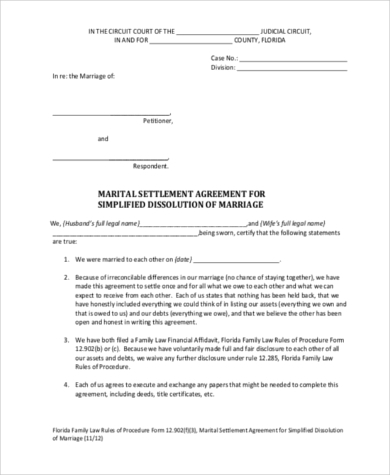 When you and your spouse are contemplating divorce and would like to be legally separated after having formally discussed and negotiated the division of your assets, then you will need to construct a Separation Agreement Form. 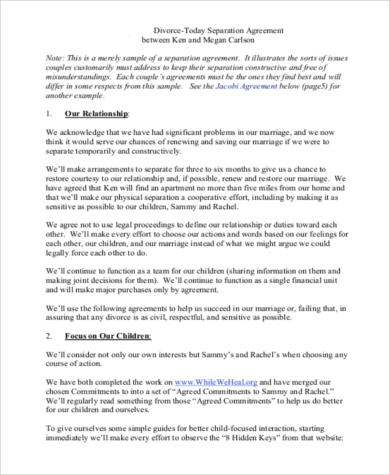 A Separation Agreement, by definition, is a contract between spouses who are separating and have resolved issues pertaining to joint, family, or marital assets, support, and child liabilities. 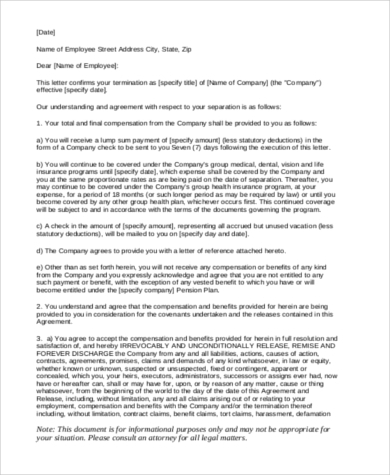 Our free Sample Separation Agreement Forms will help save you from the hassle of having to construct a contract from scratch. Our templates are free, printable, and downloadable for your convenience. Couples who are contemplating on the filing of a divorce but would like to be legally separated before any final decisions are made. 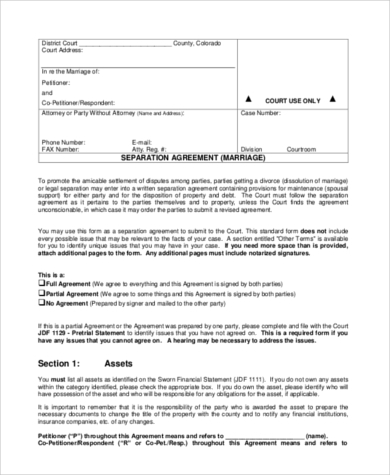 Couples who are considering a legal separation and would like to make terms beforehand on the division of properties and assets. 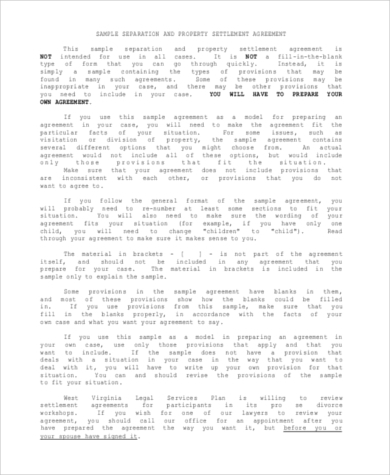 Separation Agreement have to be written contracts. Both parties have to willfully affix their signatures and should be signed in the presence of a witness. 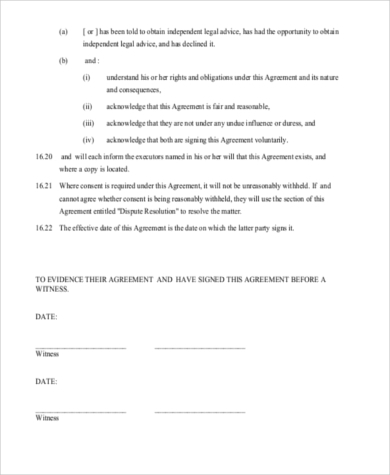 If one term of an agreement is void, only that specific term becomes void and not the rest of the agreement. 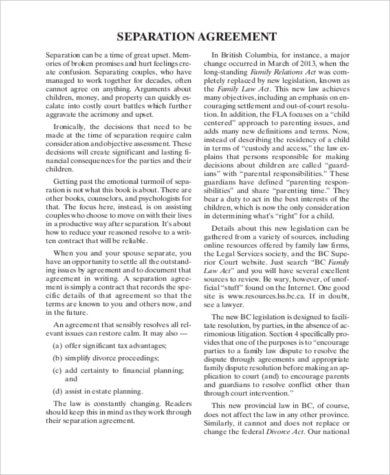 To formalize a Separation Agreement, full disclosure of assets have to be listed down as well as responsibilities tied to them, values, and other details. The agreement should indicate steps and measure on what to do with the property you have been living in. Some couples settle on giving full ownership of the property to one party, while others opt to sell it and divide the proceeds. Business and Financial Assets covers the amount of money that needs to be settled in order to achieve sole ownership of assets by each party. Another aspect of a Separation Agreement is the issue of child support. Child support is a the amount of money provided by the parent who has the least amount of time with the child to the parent who has the most amount of time with the child. Child support is usually given every month and depends on the income of each parent. Spousal support is the amount of money the other spouse gives to help finance that person’s daily living expenses. Parental rights is co-related with child support and ensures that both parents will do their best to maintain a good relationship with their children.